Helping funeral homes create state-of-the-art digital services that better meet the changing needs of their families and their businesses. As the cremation rate continues to rise, resulting in many families not having a physical grave that they can visit, coupled with the increased geographic span of people’s personal relationships, the ubiquity of technology, and the social acceptance of online grieving, the online obituary has started to take on a whole new meaning in our culture as the 'virtual cemetery' - a permanent place where family and friends can visit from anywhere at any time to reconnect with the spirit of a loved one. The online obituary is no longer just a piece of fleeting news, it’s a 'destination' - a living, breathing, evolving remembrance to be treasured for generations to come – and Tributes.com in partnership with funeral homes across the country is well-positioned to be the guardian of those memorials. Uploaded the 95 millionth obituary record to its national obituary database. Launched its 1500th custom obituary section on the Tributes Network. The Tributes Obituary Distribution Network is made up of Tributes-powered, co-branded obituary sections custom-built for television and radio media as well as funeral home websites. Processed its 4 millionth online condolence. Surpassed $400,000 in in-memoriam, charitable donations transacted on the Tributes.com platform since the launch of integrated support for memorial giving in 2011. Mobile interfaces for Tributes.com and all Tributes Network partner implementations to support the quarter of Tributes.com users who view obituary information on mobile devices. "I couldn’t be more proud of my team as together we take a moment to celebrate the achievement of much hard work and dedication to our mission: ensuring that every life story is properly told and celebrated; that obituaries are easy to find and that no one misses the opportunity to express their condolences; and that funeral homes have access to the best digital solutions to support their families and grow their businesses," said Elaine Haney, CEO and President of Tributes, Inc. "Tributes.com is driven by a highly dedicated group of individuals trying to make a real difference in people's lives and bring about innovation in a business segment that has not experienced much technology evolution, despite the unprecedented consumer adoption of technology solutions which has occurred in the last decade. We are excited about the continued growth opportunities of the Company as we work to build a major consumer brand within a lifestage where there has not been one and continue to expand our footprint in ways that allow us to provide consumers with information, services and products that help them to better navigate end-of-life." "We applaud Tributes.com as they mark this milestone anniversary. As an early Tributes funeral home partner we have witnessed the Company’s overwhelming commitment to be the most interactive, easy to navigate and state of the art platform for obituaries in the marketplace. Our community, and most importantly the families that we serve, volunteer rave reviews in regards to the warm and professional manner in which their Tributes-powered online memorial page on our website (www.magounbiggins.com) provides for interactive responses and ease of sharing on social media sites for widespread communication of information. Their recently released video creation software, fully integrated with the Eternal Tribute, saves time and effort while enabling personal reflections through a vast library of cinematic options." said Robert J. Biggins, CFSP, President of Magoun-Biggins Funeral Home in Rockland, MA and Past President National Funeral Directors Association. 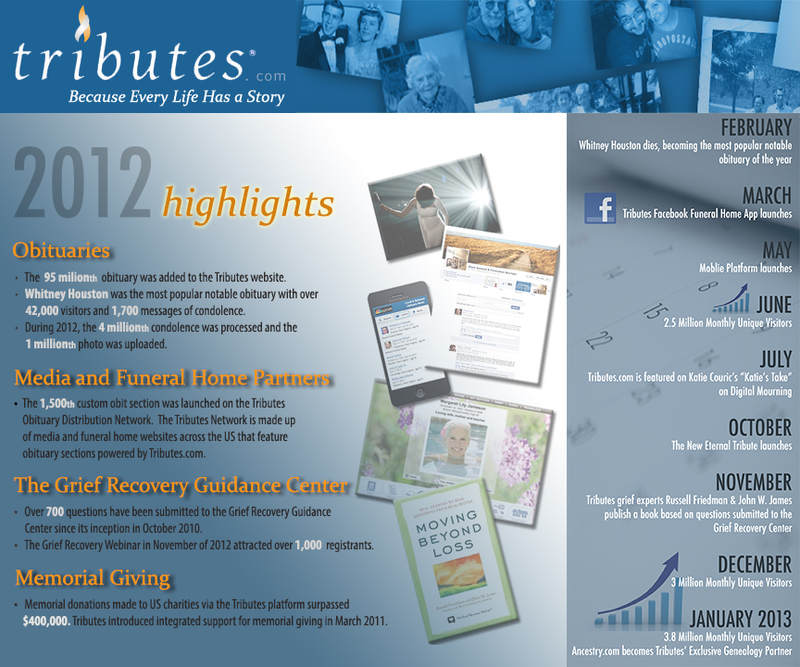 "Thank you Tributes.com for enhancing our mission of Celebrating the Dignity of Life!" Tributes.com is the online source for current local and national obituary news and a supportive community where friends and family can come together during times of loss and grieving to honor the memories of their loved ones with lasting personal tributes. Through one centralized national web destination, with 95 million and growing current and historical death records dating back to the 1930s, Tributes has made obituary and online memorial service information easily accessible. The site has experienced rapid growth since its launch in the fall of 2008, and is now relied on by thousands of funeral homes and close to 4M unique consumers each month to publish and locate obituary news. For more information about Tributes.com, please visit our website at www.tributes.com or contact us at media@tributes.com.